This crystal wedding centerpieces is thoughtfully designed-the arch shape thick metal base is solid and stable. 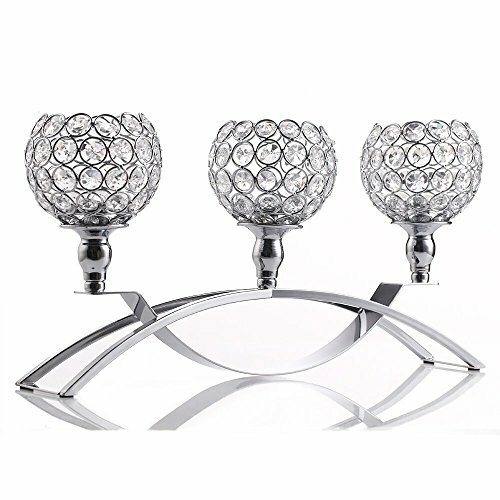 The upper add a splash of glam with 3 individual crystal tea light holders, the lights reflected beautifully from the crystals.In addation, the metal wired throughout the whole globes to make a solid craftsmanship and also ensures a nice solid air flow for a very nice bright-burning flame. With this crystal candelabra there is an endless possibilities. No matter what the theme, style, or scheme it is, this shinning and sparkling crystal candle holders is a good candle ideas for reception centerpieces. It is also a good choice for wedding, housewarming, home, bithday, party, Christmas, Halloween, Thank you table decoration. ➤HIGH QUALITY MATERIAL: The candle holder bowls are made of high quality octagonal K9 crystal beads, which are shinning and transparent. Hollow-carved design delivers a sense of dignity with natural freshness. The base through pressure casting, burnish, electroplating, polishing ect. many technological processes strengthen the property of anticorrosion and rust prevention. ➤INTIMATE FLANNEL DESIGN: Adopts superior black flannel anti-skid floor mats, cutting off the contact between the furniture and the bottom of the candelabra, reducing the friction and noise damage. ➤MULTIPLE APPLICATION: Fits best on flameless electronic candle or tea light candle, the lights reflected bling bling from the crystals. Ideals for weddings, special events, home decoration, table centerpieces,fireplace ect. If you have any questions about this product by VINCIGANT, contact us by completing and submitting the form below. If you are looking for a specif part number, please include it with your message.